Copyright 2014 The Architectural Science Association & Genova University Press. 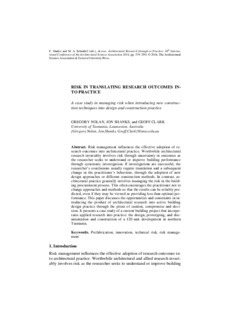 Risk management influences the effective adoption of research outcomes into architectural practice. Worthwhile architectural research invariably involves risk through uncertainty in outcomes as the researcher seeks to understand or improve building performance through systematic investigation. If investigations are successful, the researcher’s conclusions usually require translation and a subsequent change in the practitioner’s behaviour, through the adoption of new design approaches or different construction methods. In contrast, architectural practice generally involves managing the risk in the building procurement process. This often encourages the practitioner not to change approaches and methods so that the results can be reliably predicted, even if they may be viewed as providing less than optimal performance. This paper discusses the opportunities and constraints in introducing the product of architectural research into active building design practice through the prism of caution, compromise and decision. It presents a case study of a current building project that incorporates applied research into practice: the design, prototyping, and documentation (during 2014) and construction (during 2015) of a 120- unit development in northern Tasmania constructed from prefabricated timber-framed apartment modules and other innovative timber construction techniques.